Koh Samui is a small tropical island off the East Coast of Thailand with a population of over 60,000 Thai people. The island was probably first inhabited over 1,500 years by fishermen. In recent times, fishing, coconut and rubber plantations were the major source of income. The island was without roads until the early 1970s but has long attracted backpackers. In the early 1990’s tourists started arriving in increasing numbers and is now a fully-fledged tourist destination with luxury hotels, spas and boutiques. Samui is Thailand’s second largest island and you can drive around the 55 kilometre ‘Ring Road’ in about three hours. It offers a warm tropical beach climate, with average daily temperatures of about 30 C. White sandy beaches and headlands fringe the island. The main beaches are recognised as some of the best in the world with inviting crystal blue waters and you can still find delightfully secluded coves or a long stretch of beach to wander along. Low-rise housing developments are dotted with coconut palms and lush jungles climb the hillsides. The growth in luxury resorts has attracted quality chefs and restaurants. Tropical fruits and vegetables, countless varieties of seafood, free-range poultry and meats, aromatic herbs and spices blended with Thai, Asian and European cuisine make for mouth-watering dishes. And you don’t have to spend a lot, you can get a tasty meal for two with a beer for $24. 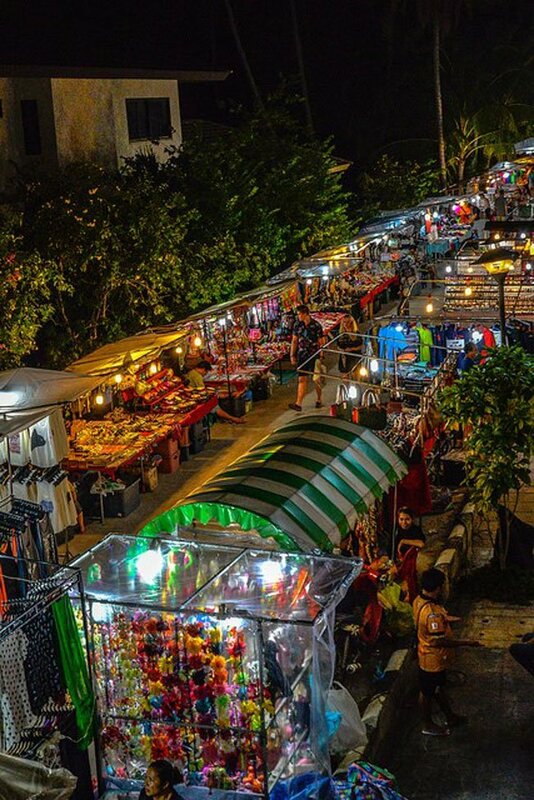 Or savour delicious meals of Thai cuisine for as little as $2 at the night markets you’ll find dotted around the island. 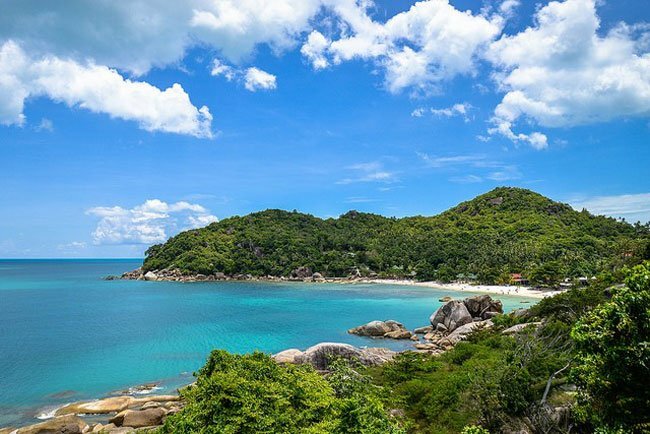 There’s plenty to do on Koh Samui too, with just about any water sport you can think of, jungle trekking, exploring temples and Buddhists monuments… wandering streets lined with historical Teak shophouses in Nathon Town or Fisherman’s Village at Bophut… or soaking up the vibrant nightlife around Chaweng and Lamai. 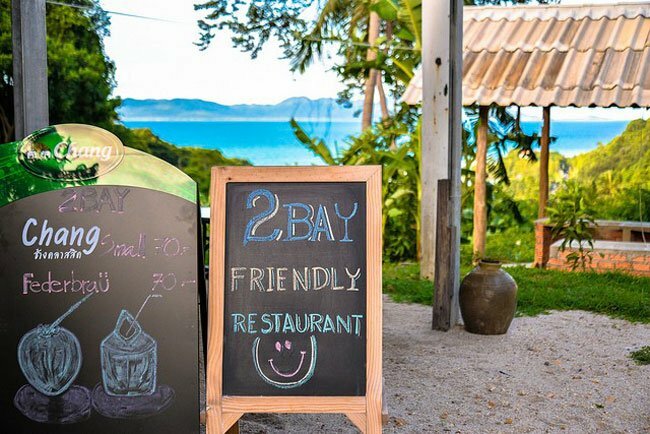 For all the attractions, Samui retains the delightful, traditional Thai hospitality and stepping away from the more touristy areas and into the towns and villages, you’ll find a world of friendly locals going about their day-to-day lives. When looking for a place to retire, cost of living is the first concern for most. Many people have a set budget, look for a comfortable lifestyle but without the same high prices from home. As you would probably expect Samui is a little more expensive than the mainland, but not that much. Depending on your lifestyle and rental requirements, expats report living here for as little as $2,000 a month. Spend in the range of $2,800 to $3,500 and you’ll live very well. And if you want to splurge, there’s certainly no shortage of ways to spend the inheritance. A couple can take in breathtaking ocean views, from a penthouse apartment in Chaweng Heights. A modern two-bedroom, two-storey, furnished apartment, rents for $1,040 a month. You have access to a communal pool, onsite restaurant and there’s 24-hour security. Drive 10 minutes and you’re in Chaweng town. If you are happy to live further from the action, you can rent one apartment for about $670 a month. And if you shop and eat like a local you can cut your total monthly costs down even more. Buying locally grown fruit, vegetables, seafood and meat cost much less than imported foods. And if you eat at authentic Thai restaurants you can get a meal including a drink for as low as $8. The quality of healthcare, particularly in the private hospitals, is as good as what you’ll find in Australia or New Zealand. Add to that prices are a third to a half of what you’d pay back home for similar services. There are five hospitals on the island, including the renowned Bangkok Hospital Samui. Local clinics are operated by well-qualified, English speaking medical practitioners. A consultation including any required medications typically cost no more than $20 a visit. Alternately visit the outpatient departments at the main public or private hospital. It is not uncommon to walk into a local private hospital and be seen by a specialist within the hour. Public hospitals are much less expensive, but generally more crowded and sometimes less well-equipped, however many of their well-trained doctors will work at the private hospitals too. Dental and optical care also high quality and low cost. A dental check-up and clean cost $57, crowns will set you back between $350 and $780. An eye test and prescription glasses will range from $80 up to $350 for more specialist lenses and frames. Many expats take out private health insurance to cover in-hospital and emergency hospital services. Very few insure for outpatient care as it is so inexpensive at local clinics and taking outpatient cover drastically increases the premium. In-hospital insurance, for a couple aged 55 and 60, can cost as little as $3,700 annually. A benefit of living in Thailand is the easy access to other countries and at a low cost. Samui has an international airport and you can be in Singapore, Malaysia or Hong Kong in just a few hours. Bangkok Airways offers residents discounts too. Car and passenger ferries traverse between Don Suk near Surat Thani and Nathon on the island’s west coast. Passenger ferries also go to beautiful Koh Tao and Pha Ngan and to mainland Chumpon, where there are connecting buses to Bangkok. Living in the heart of Asia, at a low cost, means travel is more affordable and attractive. Most expats live in the north-eastern region around Lamai, Chaweng, Choeng Mon, Bophut and Maenam where you will find the most shopping and amenities. You can get practically whatever you need on the island. There are supermarkets stocked with imported foods, white goods and furniture stores, top-notch home improvement and consumer electronic stores. High-speed, fibre optic internet and digital TV access are affordable. There are well over 1,000 restaurants on the island, plus many food and market stalls offering excellent value for money tasty meals. Fine dining establishments provide culinary delights at much less than what you would pay at home. Koh Samui has so much to do, but there’s more to this paradise island than tropical beaches, great food and friendly people. It also offers outdoor “adventure” activities like deep-sea fishing, scuba diving, sea walking, or horseback riding, archery, golf, tennis, jungle trekking, zip-lining, running and walking events and more. 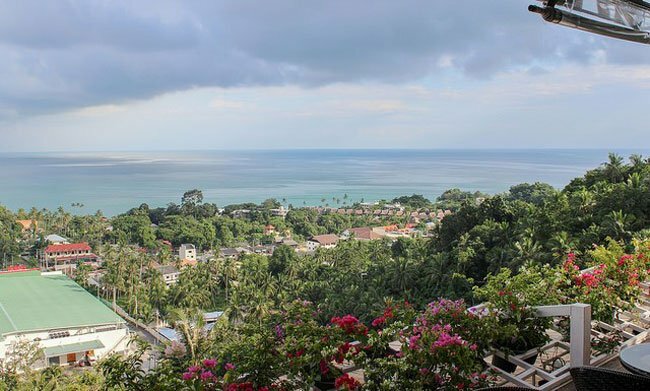 Perched high on the hillside overlooking Koh Samui’s famous Chaweng beach your home is a peaceful haven yet you are just minutes from all the amenities that tourist-friendly Chaweng has to offer. 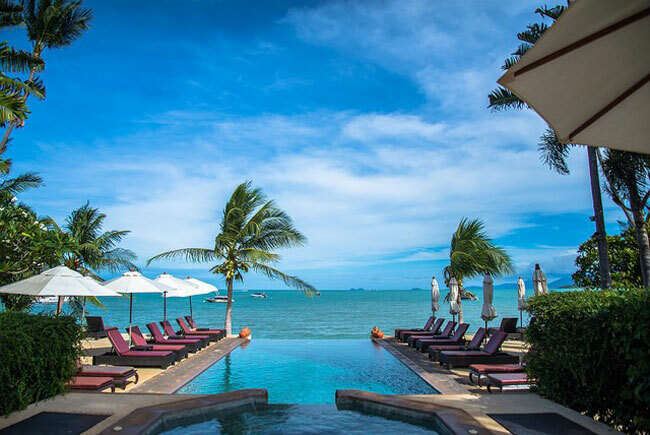 With year-round sunshine, a dazzling array of gorgeous beaches and lots of modern amenities, Koh Samui makes a great destination for anyone looking for a dream retirement by the sea. You can live well here on a budget of $2,300 to $2,800 a month. And if you rent a smaller, older home and do most of your shopping in the local markets, you can do it for even less.